As much as I enjoyed Nightshade, I was not sure if the sequel would live up to my high expectations. Andrea Cremer managed to deliver everything I hoped for and then some. We are introduced to several of the Searchers, who become instrumental in helping Calla and Shay uncover the truth about the magical world in which they live. The new characters and setting provide an added dimension that was not present in Nightshade. Calla is faced with several difficult situations as she tries to rescue her pack from the Keepers and in the process discovers who her true allies are. While Shay is committed to his feelings for Calla, the Team Ren vs. Team Shay debate is still alive and well throughout this book, which will keep ALL of the Book Nerds happy. Andrea once again managed to leave me on the edge of my seat anxiously awaiting Bloodrose, the third and final installment in the Nightshade series. The release date for Wolfsbane is July 26, 2011. If you have not already read Nightshade, I STRONGLY suggest that you do. As an added bonus, Andrea is currently giving away autographed bookplates to those who e-mail her proof that they have ordered the Nightshade hardback or pre-ordered Wolfsbane. The e-mail address to use is andreacremerwrites@gmail.com. Great review! I just recently got Nighshade and have heard from several people it was worth the read. Definitely will be purchasing this when it comes out. 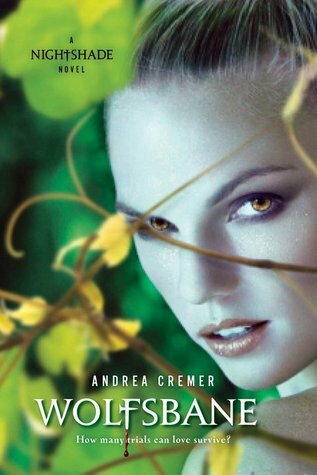 Andrea seems to have one of the prettiest covers for her books! Which is a great plus for me :) Following you now! Sooooooooooo jealous. Nightshade was definitely one of my favorite YA releases of 2010. I thoroughly look fwd to rejoining Call in her treacherous adventures. Enchanting Books, thanks for the positive feedback. The books are even better than the covers. Enjoy!! Loved the first! Cant wait for the second!! !